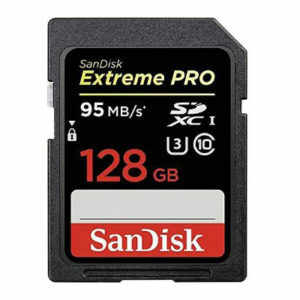 The SanDisk Extreme Pro 128GB 160MB/s Compact Flash card is the ultimate choice for professional photographers and videographers. Today’s cameras capture extremely high definition images – often in rapid succession – and are capable of recording HD video. The SanDisk Extreme Pro 128GB 160MB/s Compact Flash card is the ultimate choice for professional photographers and videographers. Today’s cameras capture extremely high definition images – often in rapid succession – and are capable of recording HD video. To get the most out of 4K video and burst capabilities, and to keep your camera running quickly, we recommend the use of a high speed memory card which can match the performance of your camera; as exemplified by this Extreme Pro card with its transfer speeds of up to 160MB/s and a sustained write speed of 150MB/s. What’s more, the Extreme Pro cards are renowned amongst professionals for their hardiness and reliability, even in extreme temperatures. The SanDisk Extreme PRO CompactFlash Memory Card is the world’s first high-capacity card that supports VPG-65, the Video Performance Guarantee specification that ensures smooth 4K video recording as well as Full HD Professionals who need the highest video-capture endurance will find the performance they need in this memory card. 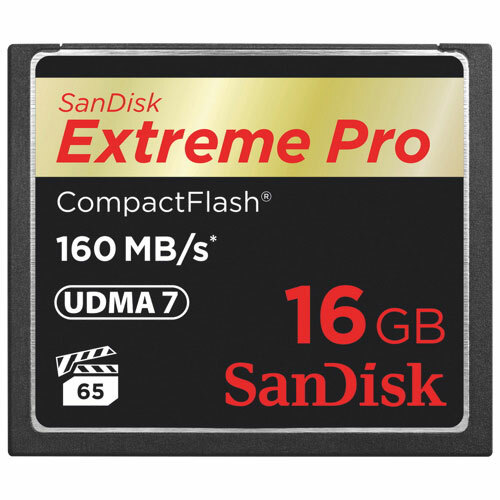 Optimised for 4K video capture, the SanDisk Extreme PRO CompactFlash Memory Card delivers a minimum sustained write speed of 65MB/s with an industry-leading shot speed of up to 150MB/s for 16GB – 128GB cards and up to 140MB/s for the 256GB card. And with transfer speeds of up to 160MB/s, it makes it easy to move even large files for storage and editing. This memory card is also UDMA 7 enabled. With capacities up to 256GB, the SanDisk Extreme PRO CompactFlash Memory Card can hold all of your high-resolution photos and memory-intense videos. With this memory card’s dependability and extreme speed, you’ll experience faster shot-to-shot performance, increased workflow efficiency, and better use of advanced functions – such as multiple frames per second shooting and continuous burst mode shooting. The SanDisk Extreme PRO CompactFlash Memory Card can operate in temperatures ranging from -25°C (-13°F) to 85°C (185°F), so you can record rich Full HD video or snap the perfect shot in almost any climate. These cards are tested with rigorous stress, shock, and vibration procedures and feature RTV silicone coating for added protection against shock and vibration. The SanDisk Extreme PRO CompactFlash Memory Card comes with a one-year subscription of RescuePRO recovery software. RescuePRO software makes it easy to recover deleted photos or videos and save them to your computer’s hard drive – even if the files were deleted months ago.